Review by AllTheBestFights.com: 2018-10-27, fight not so exciting between John Ryder and Andrey Sirotkin: it gets two stars. John Ryder entered this fight with a professional record of 26-4-0 (14 knockouts) and he is ranked as the No.18 super middleweight in the world. He lost to Rocky Fielding last year but then he has beat Patrick Nielsen (Patrick Nielsen vs John Ryder) and Jamie Cox (John Ryder vs Jamie Cox). His opponent, the undefeated Andrey Sirotkin, has a perfect boxing record of 15-0-0 (4 knockouts) and he entered as the No.27 in the same weight class. In his last three fights he has won over Geard Ajetovic, Ricardo Mayorga (Andrey Sirotkin vs Ricardo Mayorga) and Ryan Ford (Andrey Sirotkin vs Ryan Ford). 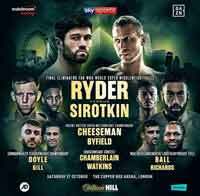 Ryder vs Sirotkin, WBA super middleweight title eliminator, is the main event of the evening. Watch the video and rate this fight!